A sports field that has never had a permanent running track seems an odd place for a bit of track and field history, but the former Oxo Sports Ground on the edge of the Downham was the location for the very first Women’s Amateur Athletics Association Championships in 1923. Regular readers of Running past may remember that the Oxo Sports Ground is now used as Millwall’s training ground and was covered here when following the Meridian Line from the edge of Croydon back to Greenwich. While the Amateur Athletics Association had been set up in 1880 it didn’t admit women and while there were renewed attempts to allow this after WW1 they met with considerable opposition. So a number of those that had been involved in putting together an unofficial international team for a meeting in France in 1921 and who were based at the Regent Street Polytechnic (now University of Westminster) set up the Women’s Amateur Athletic Association (WAAA) in early1922 to attempt to co-ordinate English women’s athletics. 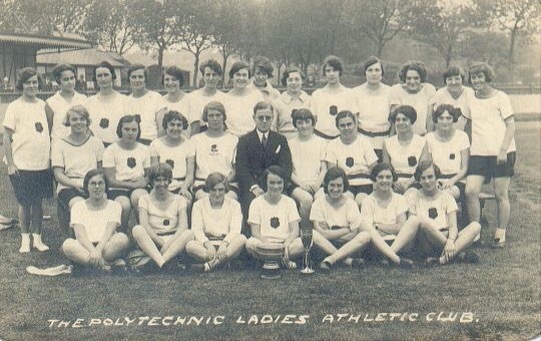 There is a photograph of the Polytechnic Ladies Athletic Club from that era which includes many of the women who featured at those first Championships in 1923, including Hilda Hatt (middle row 3rd from left), Florence Birchenough (middle row 4th from left), and Sophie Elliott-Lynn (front row, 2nd from left). There were a series of events held around the country that were given “Championships of England” status by the WAAA in 1922. For 1923 they held the first proper Championship meeting at the Oxo Ground (which had opened in 1921) on 18 August 1923. It isn’t an obvious venue – it was a grass track in a field that has a slight slope down towards the River Ravensbourne. There were new World Records by Mary Lines at 440 yards and 120 yards hurdles and for Edith Trickey for the 880 yards walk. While there are photos of the event with Edith Trickey’s victory and Sophie Elliott-Lynn in action, their copyright holders wanted £50 for their use here. 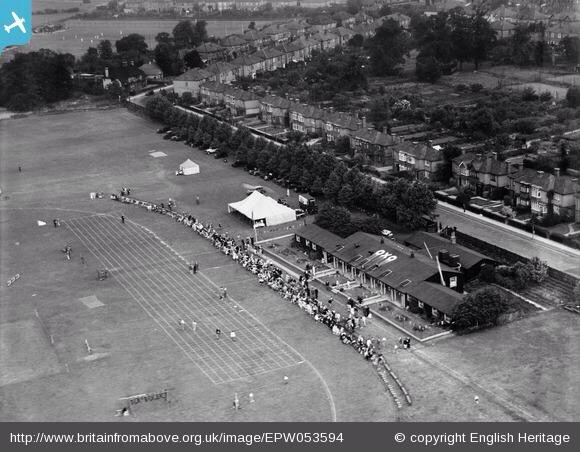 The Britain from Above site shows a vision of an Oxo sports day from 14 years later; there is more of a marked track then than there was in 1923. In 1923 Championships were the only Oxo based ones, the following year the meeting moved a few miles down the road to the cinder track at Woolwich Stadium. Mary Lines (1893–1978) was perhaps the best known women’s athlete of her generation and a real pioneer of women’s sprinting she set a total of thirty-three world records between 1921 and 1924. As a child she had lived for a while in Helix Road in Brixton Hill and attended James Allen’s Girls School (JAGS) in Dulwich. Eileen Edwards held the world record at 200 metres from 1924 (at that years WAAA Championships) until 1933. 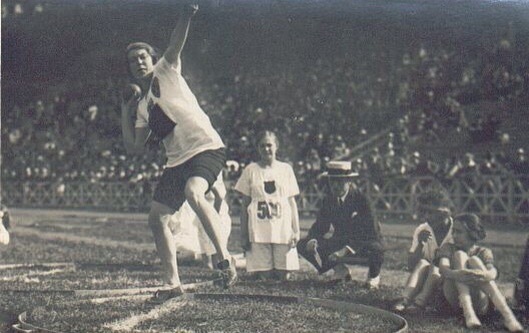 Florence Birchenough was a pioneer in the throwing events representing her country several times in the javelin, shot and discus where she was British Champion between 1924 and 1928. She continued her involvement in athletics throughout her life as both a coach and official and can be seen in action below. She was better known as Mary, Lady Heath, or sometimes Lady Icarus, and was the first woman to hold a commercial pilots licence in Britain, the first woman to do a parachute jump, as well as setting records for altitude flying. She is perhaps best known for flying from Cape Town to Croydon Aerodrome – finally reaching Croydon on 18 May 1928, which got her onto the front pages of newspapers across the globe. There is a brief YouTube biography, which is a trailer to a longer documentary which includes her high jumping, the now unusual double handed javelin as well as her landing at Croydon. Sophie Elliott-Lynn wasn’t the only athlete to be captured on celluloid – British Pathé News did several features on women’s athletics in 1922 including this one on ‘Britain’s Finest Women Athletes’ which included Florence Birchenough in both the javelin and shot. Acknowledgements – a big thank you to Rosie Sargent for letting me use some of the photos on her website of her great aunt, Florence Birchenough and the Polytechnic Ladies Athletic Club. This entry was posted in Lewisham History, Lost Sports Stadia, Sporting & Aviation Pioneers and tagged Eileen Edwards, Florence Birchenough, Hilda Hatt, London Olympiades, Mary Lines, Oxo Playing Fields, Women's WAAA on December 18, 2014 by Paul B.